Last weekend’s Breaking Bad finale drew 6.6 million watchers, the most in the show’s history, and Ad Age reported this week that advertisers paid up to $400,000 for a 30-second commercial for the final episode. But one brand got in on the buzz without a big broadcast media buy, and may have even positioned themselves favorably with a younger demographic. All via a free ad on Craigslist, a site visited by around 60 million people from the U.S. alone each month. Potentially more eyeballs than the finale attracted. 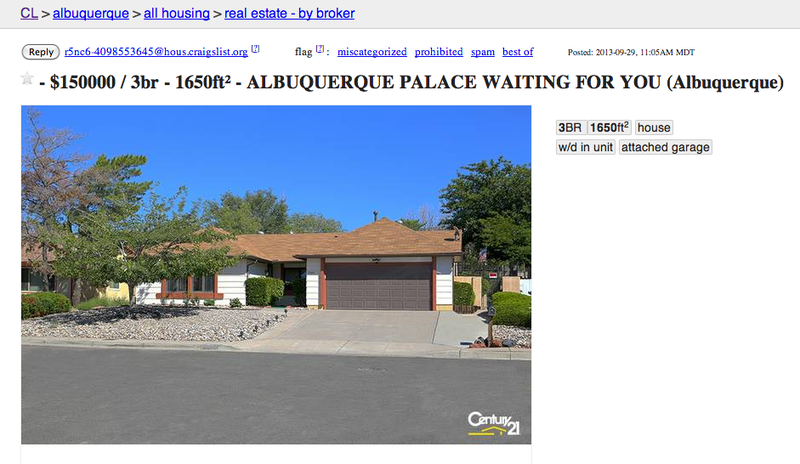 Just hours before the finale’s start on Sunday, real estate marketer Century 21 took to the web with a clever digital stunt: placing a phony ad on Craiglist for the New Mexico home of the main character, Walter White. The three-bedroom ranch style house is listed as an “Albuquerque Palace Waiting for You” at a price tag of $150,000. There’s an associated campaign on Twitter and Facebook too – perhaps something has shown up in your feed today. Craigslist began as an email list of events in San Francisco by Craig Newmark, a computer programmer in 1995, as a way to stay in touch with friends. Today users in 70 countries around the globe post more than 100 million classified ads each month. Of those listings, more than 2 million are job ads.